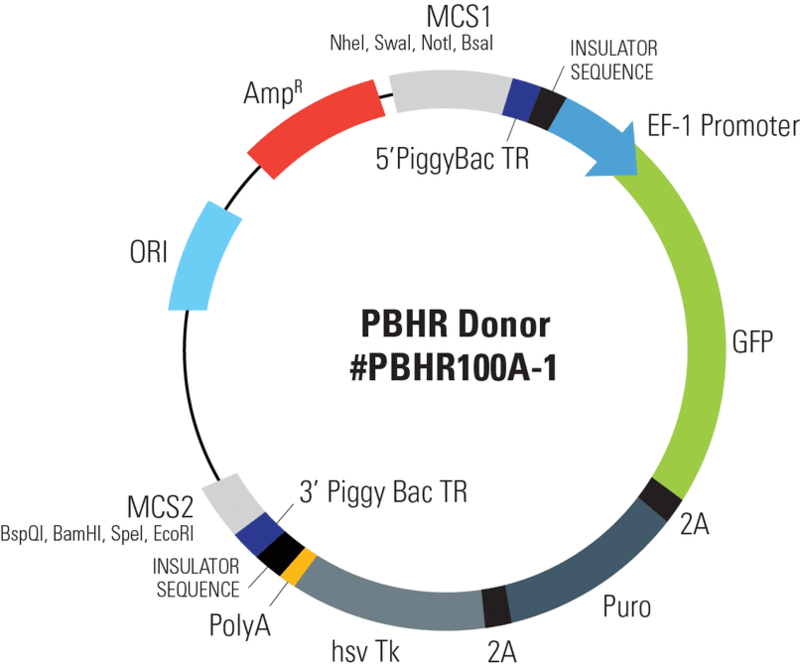 Use the PiggyBac Gene Editing HR Targeting Vector (MCS1-5’PB TR-EF1α-GFP-T2A-Puro-T2A-hsvTK-pA-3′ PB TR-MCS2) to get seamless gene editing—leave no trace of vector sequences behind. This special HR Donor works with the Excision-only PiggyBac Transposase instead of the Cre-LoxP system. Simply proceed with your CRISPR/Cas9 gene editing as usual—clone your homology arms into MCS1 and MCS2, use dual GFP and puromycin selection to find integrants, and enrich for on-target events using negative thymidine kinase (TK) selection (Figure 1). Figure 1. Seamless gene editing with the Excision-only PiggyBac Transposase. Step 1: Cas9 creates a double-stranded break (DSB) in the genomic DNA at a site that is complimentary to the gRNA. For gene editing, this DSB should be within an intron. Step 2: The DNA repair machinery is recruited to the DSB. In the presence of an HR Donor with homology to the region adjacent to the DSB (blue areas of the genomic and vector DNA) homologous recombination (HR) is favored over non-homologous end joining (NHEJ). If one of the homology arms of the HR donor contains the gene edit, it will be incorporated into the gene through the HR repair process. Step 3: Like the Cre-LoxP system, the PiggyBac Transposon system relies on an enzyme—the transposase—to mediate a site-specific recombination event between two sites, the 5’ PiggyBac Terminal Repeat (TR) and the 3’ PiggyBac TR. However, unlike the Cre-LoxP system, the Excision-only PiggyBac Transposase completely removes the 5’ and 3’ PiggyBac TRs as well as any sequences in between the two TRs. The design of the PiggyBac Gene Editing HR Targeting Vector (MCS1-5’PB TR-EF1α-GFP-T2A-Puro-T2A-hsvTK-pA-3′ PB TR-MCS2) places two homology arms just outside of the PiggyBac Terminal Repeats (TRs). Thus, after Excision-only PiggyBac Transposase activity, all vector sequences are removed.